As much as I love a good regular pancake with maple syrup, I'm really the kind of person who sets out 15 toppings for pancakes that are already filled with extra things... Here is my go to array for a Sunday (or any day) pancake breakfast (could ALSO be a great lunch if you tend to sleep late like I do... or even dinner). I'm going to show you two different ways I like to make the pancakes. Both of these recipes serve one very hungry person or two people. Blend these ingredients in a blender and IMMEDIATELY pour onto a hot pan. I coat the pan with a bit of coconut oil. This small amount of oil is pretty important. If you don't do oil just make sure its a nonstick pan. This recipe makes about 6-8 medium sized pancakes. This recipe can thicken quickly and can become difficult to pour. This is why I typically like to go heavier on the almond milk than the oats to make thinner and easier to pour batter. They cook pretty quickly on medium-high heat. About 1.5-2 minutes on each side. I used Bob's Red Mill GF pancake batter and veganized the recipe on the back of the bag. Optional: 1/4 cup of the Enjoy Life mini chocolate chips... seriously do it. Stir the wet ingredients and then stir in the pancake mix. Coat the pan with coconut oil. This option makes pretty thick batter and thick pancakes but they cooked through perfectly with about 3 minutes or so on the first side and 1.5 minutes after flipping (this is on medium high heat). Watch them and poke halfway through to make sure the insides are not too doughy. I never focus too much on exact time and just keep an eye on them. OKAY THIS IS WHERE IT GETS FUN - TOPPINGS! Berry Syrup - Very easy! Microwave frozen berries for about 45 seconds, they will get sort of liquidy which is great. Add to blender with maple syrup and blend for about 30 seconds. And that is it! You can use fresh berries but I like the berry liquid that comes from microwaving frozen berries. You could also eliminate the maple syrup entirely for a lower sugar recipe. Maybe add in a drop or two of stevia or try blending in 1-2 dates instead. 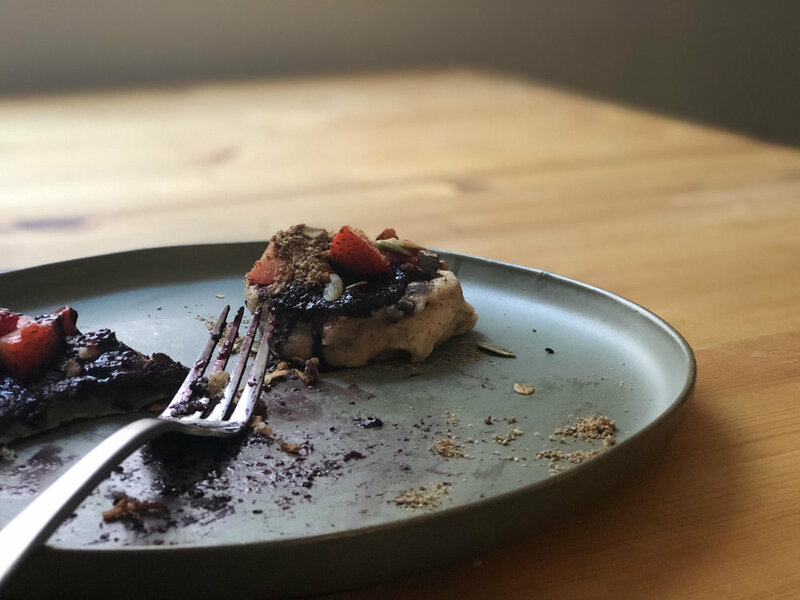 Serve the pancakes with pumpkin seeds, ground flax for those additional omega-3's, sliced strawberries, and really any other nut, seed, or granola topping. If you're thinking... really... chocolate chips AND berries... my response is YES. Just try it. It's great. The mini chocolate chips aren't overbearing and the tartness of the berries cuts the overly sweet maple syrup flavor. Let me know if you try out any aspect of the recipe!